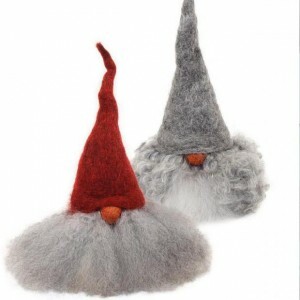 Ashbee Design: Tomte Ideas - Can I make my own? 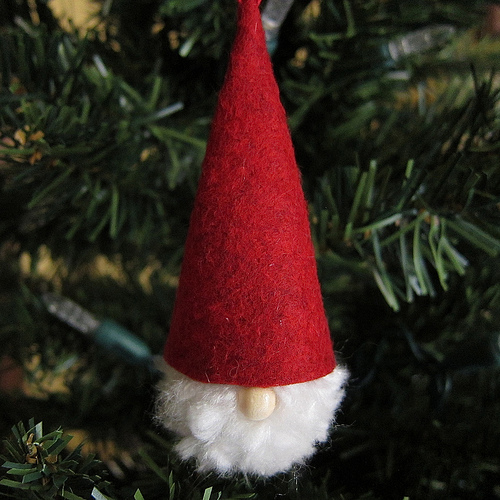 The little gnome known as the tomte is part of Swedish folklore and my family Christmas traditions. 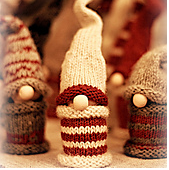 I started giving each of my daughters a tomte for their homes every Christmas. According to legend, the little elves help with the housework and we all could use assitance. 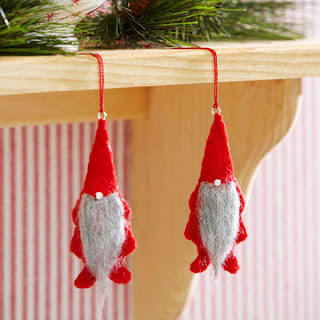 I have been collecting tomte ideas in my Christmas Pinterest board looking for one I could craft myself. Here are some of the ones I've found. This first character is a Yorkie Girl tomte. She provides a knitting how-to at her site here. Unfortunately my knitting skills are extremely basic (straight scarf only). Here are a couple of little felt guys more within my skill set. No doubt about it - the personality is in the nose! These next guys aren't handmade but available for purchase. I have just included them in my post because they reflect the type I'd like to make. I need to roam through a craft supply place looking for a solution to the beards. Love them! Kat at Just Crafty Enough has a tutorial for this ornament. Definitely some ideas and suggestions here. Have you ever made a tomten? I'd love to see pictures and receive links to instructions if you have. Those beards are so cute. Thought I would let you know- Lion. heart has a yarn that when you fray it it would end up looking just like those cute beards.... I can't remember the exact kind of Lion Heart but you would be able to tell when you saw it. It's kinda fuzzy. Thanks Tammy. I'll go looking for it and see what I can create. Need to find tiny wooden balls with no beading hole next. Oh these are all so wonderful....and such fun. I had them all around the house at Christmas time. Then the grandkids have a Tomte hunt! Each year I add to the collection. Last year I forgot to take one down and it stayed up all year. A touch of Sweden, year round. I loved it.